The colour of the Caracal's fur may be variable - it could be tawny, reddish, grey or occasionally black and their underside is light coloured. Caracals found in arid regions tend to be paler coloured than those found in woodland. They have a long slender body with long legs but their most distinctive feature are the tufts at the tops of their ears. Caracals are very difficult to see in the wild as they are able to hide themselves extremely well. Caracals are found in the dry woodland, scrub, savannah and semi-deserts of Africa and West, Central & South Asia. 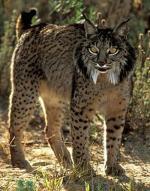 They are fiercely territorial animals and they are mainly solitary or sometimes they live as a mated pair. They can climb trees well but they are mainly ground dwellers and their territory size is between 67 and 133 Kms (40 - 80 miles) - the territory of the male being larger than that of the female. Caracals stalk their prey and they kill with a bite to the neck. They are known for their amazing ability to leap 3m (10 ft) into the air from a crouching position and kill a flying bird with a swat of their paw. They are known to be picky eaters and they discard the internal organs of any mammals that they catch and pluck the fur from their larger catches. They can also survive with very little intake of water - their water demand is satisfied by the fluids from their prey. Their diet mainly consists of birds, rodents, hares, small antelopes and hyraxes. After a gestation period of 78 - 81 days a litter of 1 - 4 kittens are born in a burrow. When the kittens are 10 weeks old they are weaned and they stay with their mother until they are a year old. The main predator of Caracals are humans. Caracals are easily tamed and are sometimes kept as pets (particularly in the USA) or used to assist humans on hunts in India. 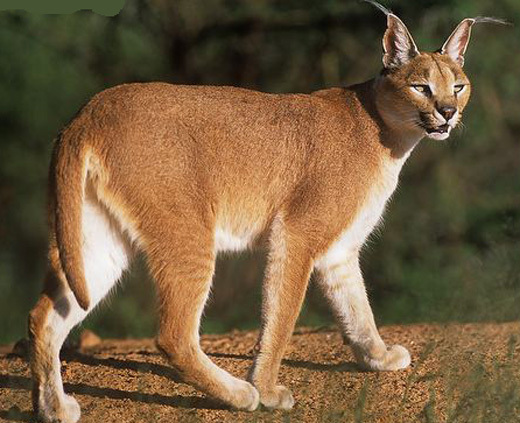 The origin of the name Caracal came from the Turkish word "Karakulak" which means "Black Ear".